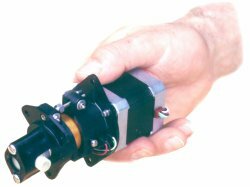 Miniature, Stepper driven Valveless OEM Pumps from Fluid Metering, Inc. (FMI) are ideal for low and micro-volume fluid control in Medical Diagnostic and Clinical Chemistry Instrumentation. FMI OEM pumps integrate FMI's unique patented CeramPump® valveless pumping principle with precision stepper control. The CeramPump® utilizes one moving part, a sapphire-hard ceramic piston, to perform all fluid control functions, eliminating valves typically present in low volume metering technologies. The valveless function is accomplished by the synchronous rotation and reciprocation of the ceramic piston within a precisely mated ceramic liner. The reciprocation action of the piston, similar to a standard piston pump, accomplishes the pumping function. However, thats where the similarity ends. The piston also rotates, alternately aligning a flat at the end with the inlet and outlet ports of the pump. When the flat is aligned with the inlet port, fluid can be drawn into the pump. When the flat is aligned with the outlet port, fluid can exit the pump. Only one port is open at any time and at no point are both ports interconnected. This effectively functions as, and replaces, conventional check valves. Utilizing sapphire-hard, dimensionally stable components, as well as eliminating check valves, results in a pump that will maintain 0.5 % precision for millions of cycles without maintenance or recalibration. The CeramPump®, having only one moving part in contact with the fluid, eliminates multiple syringes, valves, & actuators typically present in other low and micro-volume metering systems. For over 50 years FMI pumps have been used medical diagnostic and analytical instrumentation, laboratory R&D, chemical process, pharmaceutical packaging, water treatment, environmental monitoring, food processing and much more. For additional information, Call toll free 1-800-223-3388 or 1-516-922-6050, FAX 1-516-624-8261, email: pumps@fmipump.com or visit our website at www.fluidmetering.com which now features Live Help, an online direct connection to FMIs application experts.